Do you like Gap Style Cash? If yes, we have a good news for you! Gap Style Cash is back on scene. Online & In-store: Earn $25 in Style Cash for every $50+ you spend through July 8, 2017. You can earn max. $50 per transaction. You can redeem your Style Cash between August 17, 2017 and August 20, 2017. Carmembers redeem first, August 11, 2017 and August 23, 2017 when you use your Gap Inc. credit card. Source of the information is Gap. Offer is Valid until July 8, 2017. 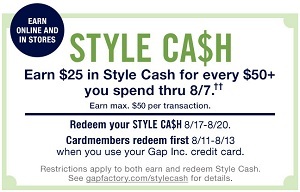 For more details visit any U.S. Gap Factory Store Location or Gap Factory online.